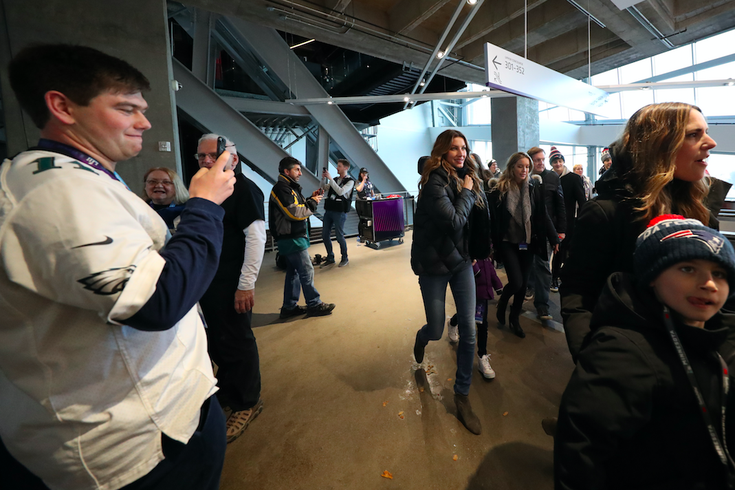 Brazilian model Gisele Bundchen (middle) wife of New England Patriots quarterback Tom Brady (not pictured) walks through U.S. Bank Stadium before Super Bowl LII between the Patriots and the Philadelphia Eagles. While Eagles fans from across the region descended on Philadelphia Thursday for the city's first-ever Super Bowl parade, Boston and the rest of New England were busy at school and work, except Tom Brady. In the moments after Eagles' 41-33 victory over the Patriots, Brady snubbed Nick Foles in order to shed a tear with his wife and kids on the way to the team's locker room. Bundchen shared a photo of the family hug on Instagram, with sincere congratulations to the Eagles and the city of Philadelphia. It turns out Brady's three children were also crying, or otherwise upset. Bundchen, according to USAToday, soothed them by possibly implying that their infallible father merely let the Eagles win. Vivian, Brady's five-year-old daughter, reportedly shouted that the Eagles won the Super Bowl. Bundchen replied that since Brady had already won five Super Bowls, it was time for the Eagles to win, since they hadn't done so in "a million years." We don't want to drag Brady's kids into this, as some others have done, but it is kind of weak that Bundchen couldn't just tell them straight up that their Dad's team lost the game, fair and square. Contrast that with the wise words of Super Bowl LII MVP, Nick Foles. In any case, Bundchen isn't happy with the way her words have been represented. It's alright. The Eagles are going to have to learn to show grace as defending champs. Sometimes you have to let other people lose.